With the establishment of Council Bluffs as an aviation center as their objective, seventy-five enthusiastic business and professional men met at the Chieftain Hotel in January 1928, to form an organization, elect temporary officers, and authorize immediate incorporation of the Council Bluffs Aero Club. The first objective of the club was to obtain an airport as quickly as possible. On that note of optimism the Aero Club leased an 80-acre field. Three months later, with the help of a city-loaned tractor and grader, work was started. Plans to construct a hangar, which would accommodate aircraft, were announced by Dr. C.E. Bowen. A.R. and C.E. Burnham and Dr. Bowen had planes at a temporary field by Manawa. The field was located on South Eleventh Street, north of Lake Manawa. A map of the site was sent to the U.S. Department of Commerce Aeronautics Branch for distribution to all licensed airplane pilots in the United Sates. The Council Bluffs Airport had national identity. Dedication of the airport was scheduled for September 28, 1928, and the City Council was asked by the Aero Club to declare that date a holiday to allow the public to attend the ceremonies. The request was permitted so far as the powers of the mayor and council would permit. The club’s request that Broadway, from First to Eighth Street, be closed to automobile parking on September 28, to permit an airplane to be taxied along the route for demonstration purposes, was also granted. The inspection on February 8, 1929, by the U.S. Department of Commerce of the South Eleventh Street site brought favorable comments regarding its potential as a first class airport. As early as May 1929, interest in properties for a municipal airport emerged, based on the desire to have a permanent field with equal privileges for all. Since the owners of the airport refused to sell the field for any price, the Aero Club negotiated an option to buy a 200-acre site from the Grenville Dodge estate. 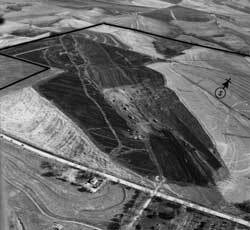 The site, located on mile east of the established airport, had been inspected by Government Airport Specialist, Marshall C. Hoppin who approved the location due to the drainage ability of the soil, its potential for grass, and the availability of bus and street car service, water and power, in addition to a hard surface road planned for construction. 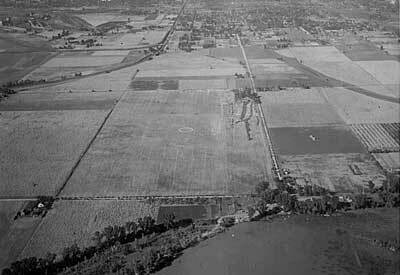 On June 29, 1929, the City Council adopted a resolution approving construction of a municipal airport. It approved the tentative location in Section 7, Township 74, Range 43, in Pottawattamie County as requested by the Aero Club. The vote was unanimous. Approval of plans and specifications for the Council Bluffs Airport by the Iowa Board of Railroad Commissioners was filed with the Council on July 8, 1929. The citizens of Council Bluffs had worked hard in the first three years to add another dimension to the City’s transportation system. The work had often been difficult and time consuming, but largely through the efforts of a small cadre of dedicated people the initial goal was achieved. The decade of the thirties was to be a period of development. The Council took the first step on January 27, 1930, when it authorized by resolution the execution of airport certificates to the estates of N.P. and G.M. Dodge in the amount of $40,000 for property purchased by the City for its airport. The Action was followed by the passage of an ordinance on February 10, 1930, providing for the creation of a Municipal Airport Commission. The New Commission began its work enthusiastically. The City Council adopted a resolution for airport improvements on March 24, 1930, and opened bids that same date. All bids were subsequently referred to the city engineer and the Airport Commission for review and recommendation to Council. Those recommendations came on April 1, and the Council authorized a contract with Boyne Construction Company for complete drainage with slag backfill, grading and construction of runways. The runways, 2,600 feet long and 200 feet wide, would be constructed from northwest to southeast with an option for the construction of a northeast-southwest runway. 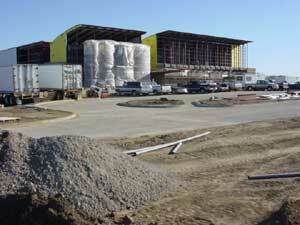 Also authorized, was a contract with Flynn Electric Company for a complete lighting system. 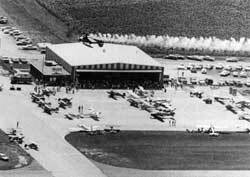 During the summer of 1932 the Council Bluffs Municipal Airport was opened. With the outbreak of the war, the Council received a telegram on December 8, 1941 from D.F. Hunter, Lieutenant Colonel, U.S. Army, in which he requested that properly authorized police officers be stationed at the airport to ground all planes except those on government duty and that the officers remain there twenty-four hours a day. The mayor and chief of police were instructed to comply. The future of the airport became uncertain. By February 1942, many smaller airports in Southwest Iowa had discontinued operations because they lacked the financial backing to meet the Civil Aeronautics Administration’s regulations. Planes based at some of them were flown to the Council Bluffs airport for operation since the Council Bluffs field was probably second in the State to receive government approval. Council Bluffs had complied with regulations that airports for private flying either be approved or abandoned. Pilots were required to register on the field and be cleared by a clearance officer before making any kind of flight. A twenty-four hour guard was maintained and the airport sufficiently lighted. Because the Airport remained dry, while Eppley Airfield was covered with water during a major flood, fifty U.S. Army cadets stationed at Creighton University began receiving their flight training at Council Bluffs. Over thirty planes were now based at the Council Bluffs field. In addition, the Civil Air Patrol Courier Service operated three flights each day from the field. On November 13, 1945, the Council took a series of steps to insure the construction of a hangar. By April 14, 1947, the Council was faced with their own flood problem. The Airport Commission requested the City take immediate action to correct flood conditions at the airport. Flood conditions were a result of a break in the dike of Mosquito Creek drainage ditch, which occurred in June of 1946. The Chamber of Commerce also wrote to the City Council, asking that conditions at the airport be corrected. A petition bearing 236 signatures was received. The Council subsequently directed the Airport Commission to develop corrective plans and submit them to the city attorney and city engineer. At the close of 1947, the Council received copies of the Airport Development Plan for the Omaha-Council Bluffs metropolitan area. The plan had been previously approved by the City Aeronautics Administration, the mayors of cities and the chairman of the Village Board, of Papillion, Nebraska. In a unanimous action on May 1, the Council gave approval of a lease agreement between the City of Council Bluffs and Harold L. Pollitt, lessee of the airport. On June 5, the Council approved the assignment of that lease to Mr. Jimmy Cook. Pollitt reported that he was no longer physically able to carry on his work at the airport. Since Cook held all necessary pilot and instructor ratings, the assignment was approved by the Council.On September 4, the Council approved a lease agreement for operating the Municipal Airport to Harry S. McCandless, doing business as McCandless Flying Service. The lease was substantially the same as with Cook. At that same meeting, the Council leased the Bayes shop building to Harold L. Pollitt. On April 21, 1954, the council approved a lease agreement on a strip of land 100′ x 20′ at the airport for the Council Bluffs squadron of the Civil Air Patrol.On June 6, the lease with Harry McCandless was renewed for two years, or until June 20, 1957. In February 1958, consideration was given to airport expansion despite plans to build an Interstate Highway nearby. The Highway Commission had notified airport officials over a year before that they were interested in buying the entire airport. Because of this, improvement projects such as hangars, administration and radio room were shelved.In May an air-ground radio unit was installed at the airport, enabling pilots for the first time to make contact with ground facilities. A new intercom system was located in the administration building. The new radio operated on 122.8 megacycles, with a radius of some fifty miles. In August 1958, the Airport Commission discussed a lease agreement with McCandless in which he was permitted to sell aviation equipment and supplies.On December 9, of that year, it was disclosed that the City would offer to sell the entire airport to the State for Interstate Highway purposes. The right-of way would cut across the northeast corner of the airport, eliminating the use of one runway and hampering flying by construction of a three level interchange 1,000 feet north of airport boundaries. On October 25, 1959, the Iowa Highway Commission announced that it didn’t intend to buy any right-of-way in the airport vicinity for five or ten years. The announcement cleared the way for the construction of another hangar and administrative building. With a new hangar, the airport would have a total of six. Perhaps the most productive period in the history of the Council Bluffs, Airport was during the 1960’s. A new airport emerged, a modern facility, meeting the aviation needs of the entire metropolitan area and southwest Iowa. On May 29, 1960, the Nonpareil reported that the Council Bluffs Airport was a pacesetter among Iowa airports. Statistics from the Iowa Department of Aeronautics provided a comparison of the Council Bluffs Airport and those of other Iowa communities. In two years, Iowa had a 38% increase in the number of registered planes. Council Bluffs experienced a 40% increase. Seventy planes were listed as based at the airport. The facility had a two-year perfect safety record – no fatalities. 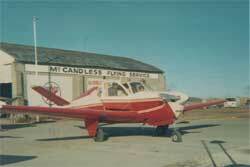 Iowa’s 78 municipally owned airports housed an estimated 707 planes used for business. Council Bluffs claimed 5% of the total. Based on population, the local airport had one plane for every 787 persons in town. Increases in planes were attributed to increased business flying in Omaha and Council Bluffs. The new nearly completed six-plane hangar was to be occupied entirely by business aircraft. Other anticipated improvements had been postponed until the Commission learned how soon the new Interstate would be constructed. In December 1952, Howard Shortley reported that the Commission had adopted a “wait and see”: attitude about moving the airport. It would be determined by the Highway Commission, which as a part of its five-year plan, would begin purchase of airport land for the Interstate. The Airport Commission as well as the F.A.A had looked at several new sites. In January 1963 it was announced that the Iowa Aeronautics Commission had approved the location of the new Council Bluffs Airport about six miles east of the City. Approval of the site by the Commission and the F.A.A., made available federal funds for construction and improvements. 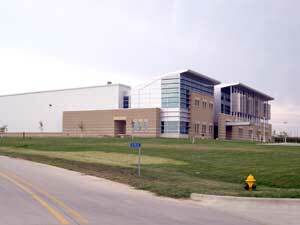 One June 29, 1964, Council Bluffs applied for federal funds through the F.A.A. Federal Aid Airport Program. The total project cost was $832.930. Fifty-eight percent ($483,965) was the local match, and forty-two percent ($348,865) was requested from the F.A.A. 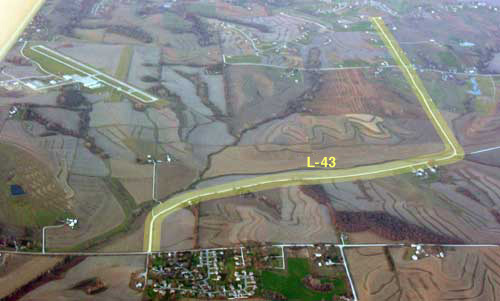 $460,000 was to come from the sale of the existing airport to the Iowa Highway Commission. In December 1964, an informal meeting with the Council and the Airport Commission was held in City Manager Paul Whites’ office. The selected site, east of the City was approved. Negotiations with the Highway Commission and the local airport group for the purchase of right-of-way in the existing facility would proceed the following month. The State had proposed to buy about 63 acres of the 194-acre airport for construction of Interstate Highways 29 and 80. However, it was indicated that the State might bid for the whole tract. 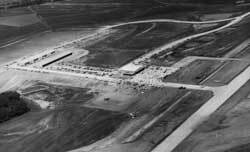 On March 30, 1965, The Council tentatively adopted a resolution to enter into contract with the Iowa State Highway Commission for the sale of the Council Bluffs Airport. A public hearing was set for April 19, 1965. Price of the sale was $400,000 with $100,000 being retained by purchased until possession. Council Bluffs was allowed to retain possession and use of the property until needed, but not later than October 1, 1965. 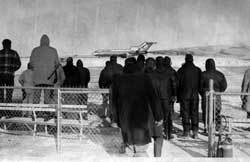 Council Buffs however, retained the right to continue the use of the two north / south runways until May 1, 1966. Permission to use hangars for the storage of aircraft was also given. The Highway Commission was to give 30 days notice prior to taking physical possession. Bluffs ready for giant step into air age; plans an $850,000 facility,” were the Nonpareil bylines of reporter John Albright’s April 25 article on airport plans. The Airport Commission hoped to start negotiations soon on a 330-acre site, 3 _ miles east of Council Bluffs. It was appraising properties near the farmhouses of Al Martin and Marion Shugart on the south side of Highway #6. The largest parcel, 160 acres fronting on Highway #6, belonged to Martin. Shugart owned a 43-acre parcel west of the Martin land and a 100-acre tract on the south side of the proposed site. Three other rural residents owned property at the southeast corner of the site: Felix Barth, 20 acres; Virgil Anderson, 4 acres; and Ed Witthauer, 3 acres. The plan called for phased development in 1965; one runway and a single building for a shop, hangar and office would be constructed. In 1966, taxiways, access roads, utilities and other buildings would be completed. The Iowa Aeronautics Commission was asked to set aside $25,000 from the Air Fuel Tax Fund for use by the local Commission as local match of federal dollars before June 30, 1966. 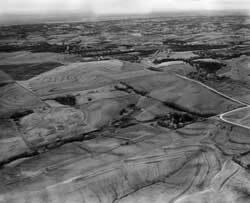 On June 7, 1965, the Council adopted a resolution for the purchase of land from H. Martin, A.F. Martin and Winifred Martin. The construction of a new airport facility received top priority on the City’s list of projects for 1966. Specifications called for grading and construction of drainage facilities, the paving of a 4,100-foot Northwest/Southeast runway, construction of an access road, taxiway and apron, installation of a 15,450 foot wire mesh fence, and 140 acres of grass seeding. 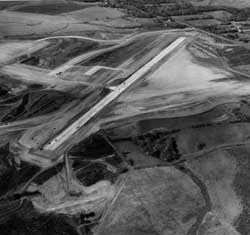 On March 15, 1966, officials and engineers reduced the length of runway 500 feet, also reducing the cost estimate to $399,000. The runway was consequently shortened from 4,100 to 3,600 feet. In early May 1966, it was decided that the Airport Commission would become advisory and an airport manager would be hired, perhaps a fixed based operator. The Airport Commission had operated independently since the 1930’s. Harry McCandless, Flight Service Operator, had been lessee and manger of the airport for the prior fifteen years. It was also decided to have 30 t-hangars, 15 with ports and 15 without. Facilities for ten planes would be built, using the open aeroport design of building. Plans and specifications on construction were to be filed with the City council at the first meeting of January 1967, with a proposed public hearing on February 1, 1967. 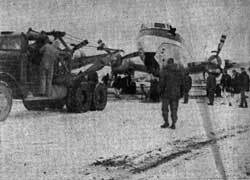 It was reported by the Nonpareil on December 3, 1966, that Harry McCandless would resign as operator of the Municipal Airport on December 31. “I’m not too interested in the new one,” he told the Nonpareil. “It’s going to be a pretty big operation and it might be too much for me to handle.” McCandless had started as airport manager in July 1951 succeeding Jim Cook. The Airport Commission met again on December 30, 1966, presenting McCandless a memorandum commending him for his ten years of service to the Council Bluffs Airport. All the Commission members signed it. Upon seeing the plans for the new facility, Mr. McCandless indicated that he might still be interested in being a fixed base operator for the new airport. On June 25, William Frueh reported that the new airport had received F.A.A. approval and the old airport would be closed. The new airport was scheduled to be dedicated on July 4, 1967 at 10:30 am in front of the main hangar. It was perfect flying weather. More than fifty pilots registered for the breakfast. Two hundred persons opened the festivities. There were 10,900 people at opening day events. The ribbon was cut by airplane propeller. Inside the plane were Lewis Ross, Jr., Chairman of the Airport Commission, F.B.O. Ray Surges and Mayor pro tem Dr. Walter Hathaway. The F.A.A. grant allocation of $11,500 for airport runway lighting, was welcome news when received on September 5. On December 24, 1969, an agreement with F.A.A. for a $50,000 grant was signed, setting in motion the construction of a parallel taxiway to the northwest/southeast runway and connecting taxiway, installation of electric duct work under the taxiway and seeding. Council Bluffs had a brand new airport facility and its potential was never greater. By April 25, 1971, all plane hangars were occupied and space was being rented in the main hangar. The Commission was considering the construction of an additional t-hangar, which would provide space for fourteen more airplanes. On October 4, 1971, the Council approved payment of $740.25 to Iowa Aeronautics for runway identification lights for runway 31. This was the City’s 50% match on the project. On December 8, 1971, the Council Bluffs police chief discussed a proposal to construct a new pistol range at the airport site. All Commission members approved. T-hangar rental came under review again on June 12, 1974. The Commission then recommended to Council that the rate be changed from $30 to $40 per month. The Council concurred in this recommendation on June 17, 1974. The Commission approved a request from the F.B.O. to remodel the airport lobby on August 14, with the provision that all improvements would become the property of the City at no cost, and with the approval on the City Council. On August 14, 1978, the Council granted permission to the fixed base operator to use the leased facilities for a flight-training program for Iowa Western Community College. On April 23, 1979, Mayor Scheer, based on Resolution # 79-180, signed the contract with Coffman and Associates. A grant application was prepared requesting a $24,000 federal portion, or eighty percent. It was the beginning of the first Master Plan for airport operations. The City’s match was $6,000. On November 10, 1980, the Council received, filed and approved the Airport Master Plan. The city manager was then authorized to sign the plan and submit it to the F.A.A. The Council Bluffs Airport is in the right place at the right time. 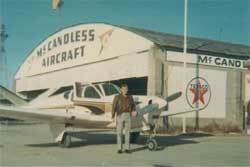 Dan Smith came to CBF in the early nineties to operate a propeller shop as a subtenant of the existing FBO. In 1996, he acquired the operation and renamed it Advanced Air, Inc. Since 1998, the momentum has continued to build. The city, county, state, and federal governments have all played a role in developing the infrastructure to put the airport on the road to becoming a first-class general and business aviation reliever for the Eppley Airfield, the stated mission. Since 1994, a lighted taxiway and additional ramp have been constructed, and plans are underway for a new GA terminal and a 5,500-foot crosswind runway. The airport encompasses 589 acres, 170 of which are targeted for aeronautical development. Through the vision of the Council Bluffs Airport Authority board and Executive Director, Dan Smith the east side of Council Bluffs is experiencing some exciting growth and development. The airport expansion has proven to be a catalyst for numerous other projects. County road L-43 has been paved. Grading and other preparations are also scheduled to start on the airports new runway 18/36. Plans are being considered to build new hangers to keep up with the airports increased demand. Talks are also underway regarding a new business park development that could add impetus for economic development in the area. In 2003, 91 planes were based at the Council Bluffs Airport exceeding the expectations of design engineers, making the airport a very busy place. County road L-43 is completed. 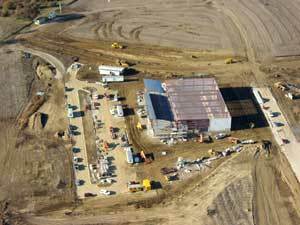 Land was purchased and excavation started in 2003, paving began in mid-summer 2005 on runway 18/36. Also, at this time the Airport Authority completed the paving of road L-43, which created a paved access to Highway US-92 from Highway US-6. On December 28, 2006 Runway 18/36 fully opened. In 2007 another important milestone was accomplished when sections A & B of Eastern Hills Drive were opened. This enables a more direct route from Interstate 80 to the Council Bluffs Airport at 16801 McCandless Lane. In 2008, Runway 14/32 was completely reconstructed and re-opened. Also, the ramp around the older small t-hangars was broken up and replaced with concrete having proper slope and drainage. 2009 was a productive year. An additional 10 t-hangers were added on to the existing hangers on the west side. The new terminal was opened in October of 2009, featuring a pilots lounge, meeting rooms, flight planning and other amenities. During 2010 the ILS will be installed and commissioned and the itinerant apron will be torn up and replaced in segments to minimize the inconvenience to pilots. Runway 18/36 fully opened. The runway is 5500 feet long.